As any boat owner who regularly fishes in salt water can testify, corrosion is their worst enemy. Below are some regular maintenance tips to help you get the most life out of your trailer. Trailers use ball bearings, which require grease. We recommend marine grease that won’t dissolve when exposed to salt water. If you want to really protect those bearings, you can prevent water intrusion by using bearing protectors. These typically stay sealed for up to six months, but still require new grease added regularly. Trailers typically use galvanized parts which are prone to corrosion, especially with excess salt build up present. The best way to combat the elements is to rinse your trailer with fresh water after each use. For each saltwater fishing trip you go on, you’re giving your trailer a double dip in the drink. After a long day in the sun, one of the last things anyone wants to do is spend time thoroughly washing off a trailer. You can eliminate the hassle by installing Starbrite’s Trailer Spa. This system can be customized to specifically target any area of your trailer which is prone to corrosion build up. And last, but not least; here is a basic checklist to cover prior to heading out to your favorite ramp. Cross your trailer’s safety chains when connecting to the vehicle. Ensure your trailer tongue jack is all the way up, or folded and locked. Ensure all lug nuts are properly tightened. Have a secure tie-down strap for the back of the boat. Trailer tires carry bigger loads than cars. Regularly check for wear. Test your trailer brakes, if applicable. Make sure your trailer lights are working, including turn signals. Make sure your trailer ball fits the trailer, seats snugly and is free of debris, and the fastener pin is secure to the truck hitch. We hope these tips and suggestions will assist you in prolonging the life of your trailer. Should you find yourself in need of additional information or parts, please contact us at 954-922-8890. Some of the most frequently asked questions regarding fiberglass boat construction revolve around the techniques used to secure the fishing boat deck to the boat liner and the corresponding attributes of the end product. This article will shed some light on the types of fiberglass boat construction and give you some insight into often overlooked aspects of boat ownership. How exactly is the boat deck secured to the boat liner? In two piece fiberglass boat construction, the boat deck is secured to the boat liner with screws, rivets and/or adhesive. This typically allows for potential issues in the future as the screws and rivets work loose. Additionally, the negative impacts on the overall “ride” of the vessel are noticeable due to the jarring impact of having two separate pieces distributing the shock of the waves when running. In three piece fiberglass boat construction, the boat deck is bonded to the boat liner by glassing the two pieces together. This provides a stronger, more secure bond between the two pieces, disallowing for any shifting. The overall effect is a more comfortable ride and stronger side walls. In three piece construction, the liner is pushed directly against the hull. This can equate to as much as 6-8” of additional boat deck space.Two piece construction has a different cap and mold design in which it is impossible to get the hull and boat liner flush together when building a fishing boat. Three piece construction allows a “toe kick” area in which your feet (and knees) can slip under the gunnel. This allows for increased stability when fighting a fish or any other activity which requires you to lean against the sidewall, as well as less instances of stubbed toes.In two piece construction, there is either no toe kick or just enough room cut out for your toes which leaves your knees to take the abuse. Rod holders, rod holders, rod holders. Rod holders are an important part of any fishing boat and the differences in installation in two piece and three piece fishing boat construction are pretty big. In three piece construction, rod holders can be installed virtually anywhere. Since you can easily access underneath the gunnels, you can bolt down any rod holders installed after the boat leaves the factory, and it doesn’t involve hours of tedious work to do so. Additionally, the rod holders are able to drain directly onto the boat deck.In two piece construction, you can only screw down rod holders from the top and you either have to run hoses for drainage or risk them draining directly into the hull. Remember that toe kick we discussed earlier? In two piece construction, many times coaming pads are used to give you that little bit of extra room. This further decreases your available deck area and adds cost and extra maintenance. In three piece construction they are solely an option and less of a necessity. This follows the same concept as the rod holders. In three piece construction you’re able to easily install lighting or outlets (shore power, DC outlets for electric reels, etc.). Additionally, the outlets won’t stick out and catch on legs as you’re rushing across the boat deck get to that screaming reel.In two piece construction, there’s nowhere to hide the lighting and outlets, making it unsightly and bruise worthy. All things considered; three piece fiberglass boat construction clearly has the advantage over two piece construction. While the overall cost of the three piece constructed boat may be slightly higher than that of a two piece boat, the long term benefits and conveniences will negate the additional investment. For more information or to find the right boat for you, please visit www.dusky.com. The arrival of November usually signifies the final stanza of our fishing season here in Cape Cod.The days are quick and often cold, with the night times longer which allows for rapid cooling at night, and many times the weather has already turned from pleasant and fall like to downright cold and winter-nasty. This season, however, we were treated to a true New England "Indian Summer" where the mild temperatures and limited winds followed us all the way through October and right into the first three weeks of November. The warmer than average days brought many trips where my anglers were in shirt-sleeves, bright sunshine as the backdrop for lights-out fishing with light tackle for the ocean's baddest fish that swims...the bluefin tuna. With trips getting off the dock every day for the first 3 weeks of the season, the incredible fishing was extended longer than it normally would be, providing for one of the most memorable fall runs we have experienced in quite some time. With the fish feeding with reckless abandon, the sizes of these fish was also a bit larger than normal, making for challenging fights and unbelievable sushi from the fish that were harvested. We were able to place archival tags for science purposes in numerous fish and finish up the 2014 season with a respectable catch total on the year despite the slower than average start due to weather. The Dusky took it's last trip on November 19th, catching fish right up to the last hour, leaving them biting for another season to come. After such a challenging season and busy finish, the boat and captain of Coastal Charters Sportfishing need a well deserved rest....see you in the spring! The incredible fishing we experienced in September continued into the month of October, as did the mild weather and calm winds. With higher than average air temperatures and water finally comfortable for the tuna, the bite solidified even further and the pattern of hot bites was almost a given on any trip. The sizes of the fish continued to increase, with some real heavyweights n the mix. The first part of the month was topped off with a once-in-a-lifetime catch of a 3 angler crew aboard the Dusky. 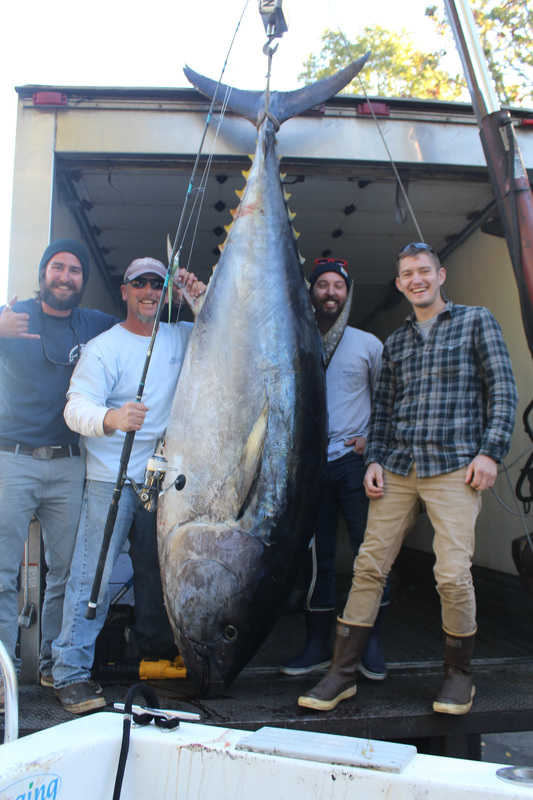 What could be the biggest bluefin ever hooked and landed freestyle with an artificial lure was brought alongside and ultimately graced the deck, measuring an amazing 101" fork length and topping the scales at 600 pounds. Without a doubt fish of that size are a trophy using any gear, but on light tackle with an 8 foot rod and no harness is just nutty! With an amazing feat like that on one vessel you might think that the rest of the trips would be a let down afterwards, but not the case here in beautiful Cape Cod. As the days grow even shorter and the cooler nights set in, the bluefin feel the need to gorge in order to fatten themselves for the impending migration. The amount of bait nearshore coupled with prime water conditions and an easy run allowed the crews aboard the Dusky to cash in on the bonanza. Each trip out this month saw multiple shots at bluefin tuna on light tackle, and the game shifted over to a top water bite, with incredible surface shows the norm each day, and an amazing run of successful trips. The fall run could be described as "full tilt", with zero signs of slowing down. Cape Cod draws anglers from all over the world to it's shores in hoes of connecting to a bluefin tuna on light tackle. Coastal Charters Sportfishing specializes in jigging and popping methods, and year after after year the crews aboard the Dusky put trophy sized specimens on board on a regular basis. The month started out with a bang, as a group from Singapore tied into a fish of a lifetime after traveling halfway around the world to have their shot. The fish was hooked on a jig in deep water and fought freestyle without a harness, topping the scales at a very respectable 240 pounds. The month continued to heat up, showing signs that the topwater bite may materialize as more and more fish moved into the area while the bait continued to stack up near shore. Each day saw shots on both subsurface as well as up top, yielding many multiple fish days for the intrepid crews. The water continued to warm, and the weather actually improved to giving us one of the nicest stretches of days on the water all year. Normally around mid month the weather begins to turn again, this time the opposite way as summer yields to fall and October approaches. The days get shorter, and the winds can sometimes be brutal limiting the number of trips that can be safely and successfully run each week. This year the winds decided to settle nicely, and we enjoyed a stretch of fine summer like temps with very little rain coupled with calm seas. This allowed a nice pattern with each trip keeping the Dusky on top of the movements of the main groups of tuna, with a great mix of both topwater and jigged fish, on a nice average size of 100 to 125 plus pounds, with a few larger fish in the mix. Without a doubt, August is our favorite month for offshore pursuits here in southern New England. The weather is usually the best of the year, with warm water, warm days, and gradually increasing night-time periods, the fish have typically settled into a pattern and provide a much more stationary target, if that is even a word which should be used to describe bluefin tuna! The colder water still lingered in certain areas, so the first week of August was spent on our southern grounds, mixing small school bluefin with other pelagic species like White Marlin and even thresher shark, all on artificial lures. As the cold water finally once and for all let go of it's tight grip on our fishing grounds, we were able to move back to somewhat more normal grounds, although to start we were running quite a distance in the Dusky, sometimes 55-65 miles to the SE in less than favorable seas. The top water bite we were looking for di not materialize all that well, but the deep water bite on metal started to heat up pretty good, and we began to enjoy results more amenable to the captain and crews. With summer in full swing, and the weather cooperating with mild winds and mainly fair says, the Dusky and it's crews cashed in daily on the ever-growing schools of hungry bluefin that were making their way into the bait rich waters to begin their feeds in earnest as the days grow shorter and the nights begin to cool towards the end of the month. The vertical bite continued to produce excellent results, with the occasional fish coming by way of a top water bite. The fish continued to push closer to our normal stomping grounds, providing numerous chances even on days when the fish didn't feel much like playing with us as we were able to spend much more time fishing for them and far less running for them. The end of the month showed promise that the start of something good was about to occur, with all signs pointing towards a classic set up of lots of bait and lots of tuna all converging right in our backyard. Weather continued to rule the day as we finally left the cold, foggy June behind, hoping for s break in the cold and a warming of the tuna bite. The water temperatures nearshore around Cape Cod are typically warmed by late June, and July through September usually the warmest of the year. The Labrador current is a cold water current which wells up just off our coastline, and the conveyor effect has held that water tight to the area all season thus far. Each day the fog prevented any real hunting from occurring except with the sounder, which effectively rendered our methods useless for the better part of the first 3 weeks. The striped bass and the whale show continue to be our only option, staying inshore despite the burning desire of both captain and crew to roam the offshore grounds in search of the prize, the almighty bluefin tuna. The last week of the season finally saw a break in the colder air temps, and the winds and fog finally receded to allow the more summertime-like conditions to creep in and jump start the offshore bite. The Dusky was moved on it's trailer to a different area of Cape Cod, a feature which allows Coastal Charters Sportfishing to provide the best chance at having a successful day, decreasing on-water transit times and increasing the amount of angling time. With the fish just starting to move in on some distant grounds to the south, we were able to get on the action fast and stay on it as it developed. We were also fortunate to discover a few white marlin roaming these southern fishing grounds, the elusive billfish providing great challenge, mostly with the fly rod. The tuna bite heated up dramatically, with large groups moving through the area daily, and our catch results improved early and often. Multiple catch days became the norm, and although the first few weeks saw much smaller specimens than we were used to, we scaled down our tackle and had a blast tagging and releasing some of the smallest bluefin we have seen in numerous seasons....a great sign for the coming years!